What is it Like Being a Single Man? 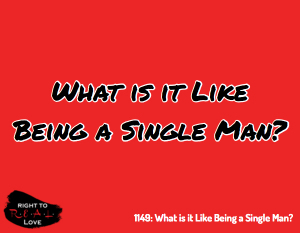 1149: What is it Like Being a Single Man? In this episode, Yahnathan addresses this question from a R.E.A.L. Lover in The Bronx: What is it like being a single young man? Episode Title: What is it like being a single man? What is it like being a single young man who honors YAH with his body while choosing to remain single? Top 3 challenges Yahnathan has faced while being single. Different ways to overcome challenges we encounter while we’re single. Habits and practice that help Yahnathan maintain a lifestyle of purity and honor YAH. “Or do you not know that your body is the Dwelling Place of the Set-apart Spirit who is in you, which you have from Elohim, and you are not your own?